Sometimes finding quality, fun and unique stuffing stuffer gifts can be hard. But I have a few I wanted to tell you all about. I know, I would be excited to get any of these in my stocking. Have a young lady in your life that likes to do their nails? The Tweexy is a must have for those who do their own nails. When I am painting my nails, I often knock over the bottle of nail polish. I also have a child and pets. It also never fails that when I want to do my nails they are hovering around me. With Tweexy I can nest my bottle of nail polish inside, wear it on the hand I am polishing and never have to worry about knocking it over or having it knocked over by my audience. It pops over your fingers so no need to worry about sliding it off your hand and messing up your freshly polished nails. I share a bathroom with my daughter so having a ton of soap bottles is a hazard. She frequently knocks over bottles of shampoo, conditioner and soap while she is taking a bath and playing with her toys. So I try to limit the amount of bottles we have in the shower. The Fiat Luxe felted soap is perfect for this! Plus anyone can use it no matter their age. I also love how it feels. Unlike bar soap, you won’t have to worry about it slipping out of your hands. Or spilling it down the drain like liquid soap. Plus it’s beautiful! This would make a perfect hostess gift, teacher gift or housewarming gift. 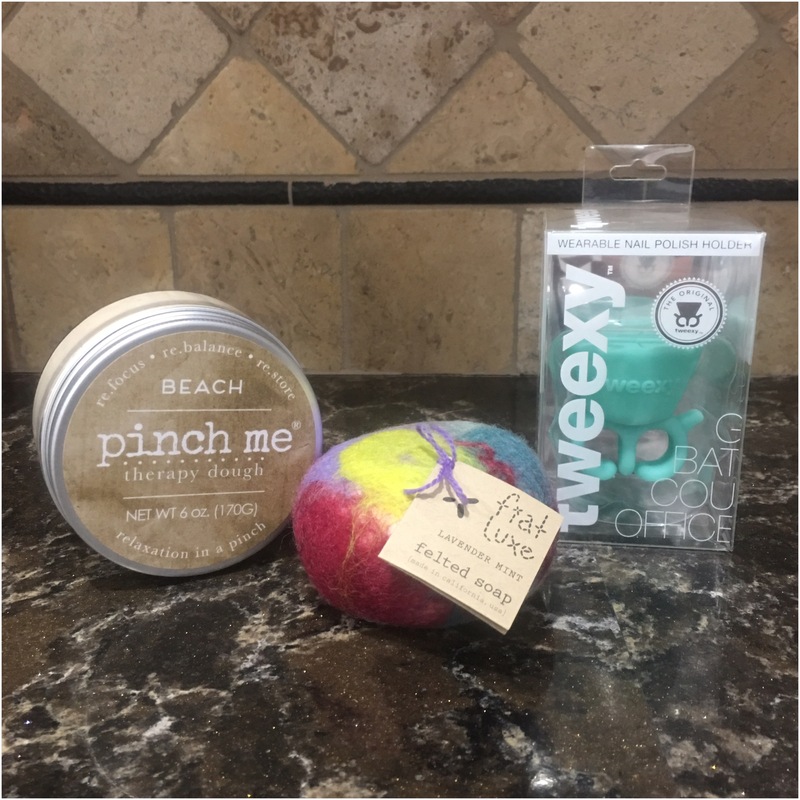 I really love the felted soap and cannot say enough good things about it. The soap itself is handmade and uses essential oils. You won’t find any artificial or harmful chemicals in Fiat Luxe. Are you looking for a gift for a coworker? I have one for you! Pinch Me therapy dough. It’s perfect for those looking to relieve a little stress. Made with wheat, essential oils, and calming, aromatherapy scents, it’s a natural product. When you are feeling stressed simply take a little Pinch Me therapy dough out and knead it or mold it. It’s a natural, holistic, drug-free, portable stress reliever. It can even be stored in the fridge for a different sensory experience. When you are done, simply place it back in the tub, twist it securely shut and put away until the next time. All these can be found at The Grommet. The Grommet is an online marketplace full of unqiue, innovative products from small business. Since I’m a small business owner I love supporting other small businesses when the opportunity arises. Check out The Grommet for all your gift giving needs. New businesses and products are added all the time so be sure to check back often to see what’s new.